Create a complete TV and Radio Catch-up interactive service for Canal Sur DTT service. To develop a complete Online Video Platform to manage audio, video and live assets and deliver them to a HbbTV application. Canal Sur, the Andalusian regional TV corporation in Spain, offered in his web access to video and radio on demand. But they were looking for a new approach inside DTT service. HbbTV became the suitable solution for offering access to its complete Alacarta VoD catalog. Tmira Solutions integrated his OVP platform and CDN to Canal Sur IT and Production infrastructure, to be able to manage all live and on demand contents, that actually give more than 2,400 hours of video. Our CMS works with Canal Sur MAM servers to ingest, process and insert metadata in all HbbTV-selected contents. 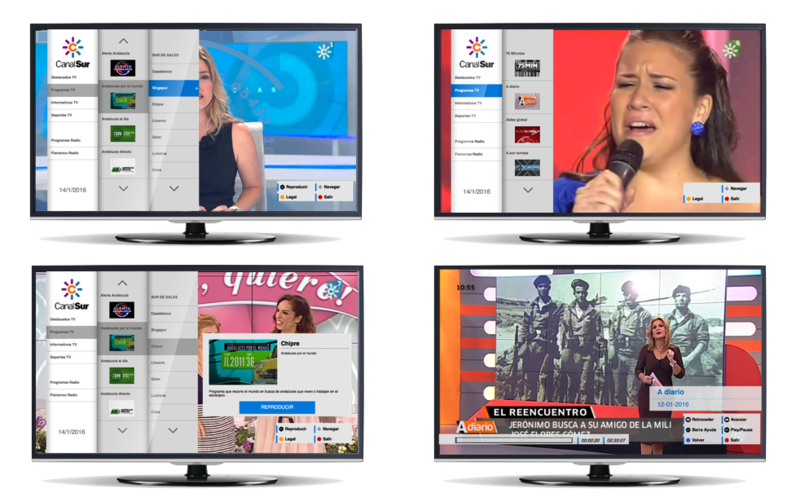 Since service launch, Canal Sur HbbTV service has grown to include all their regional live feeds and a spectacular Flamenco app, where enthusiasts can browse and enjoy more than 3,000 songs from best Flamenco artists.